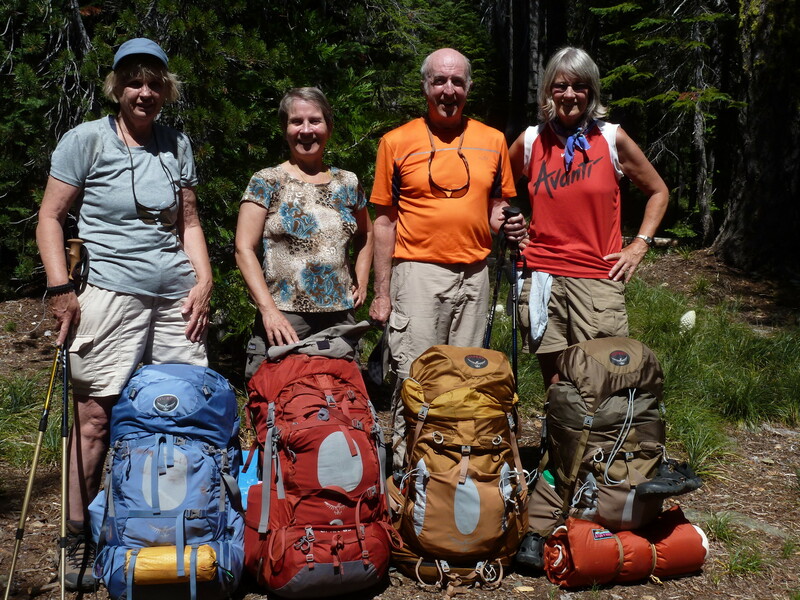 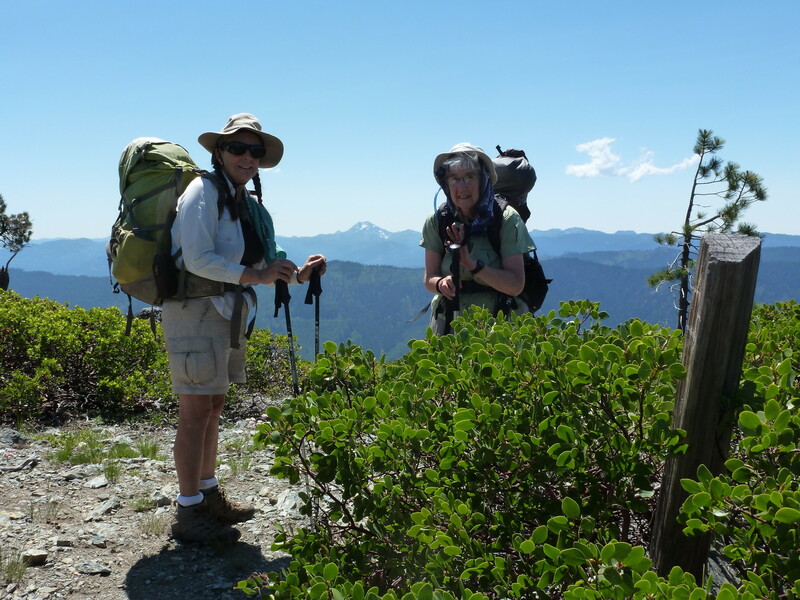 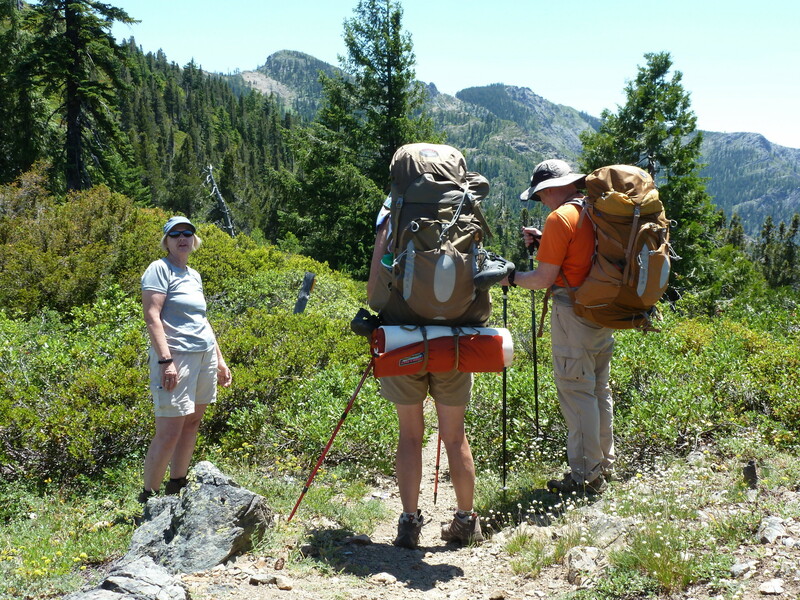 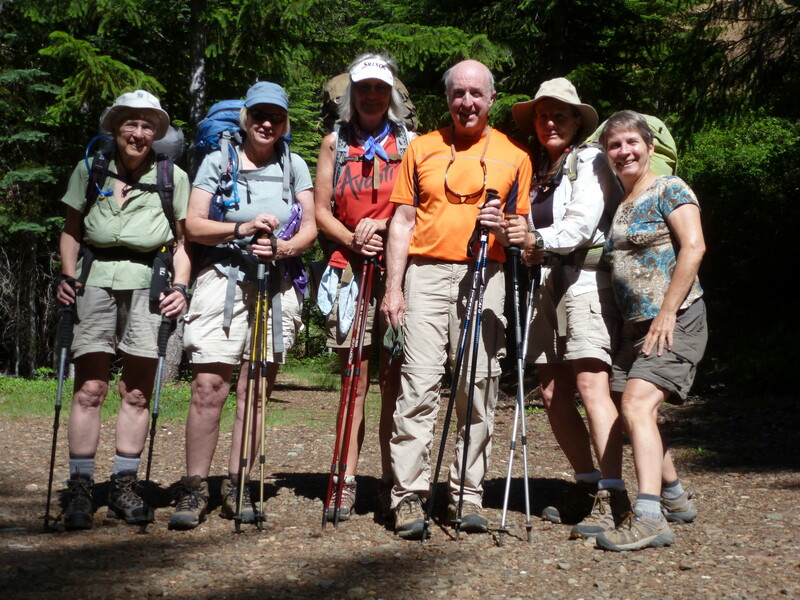 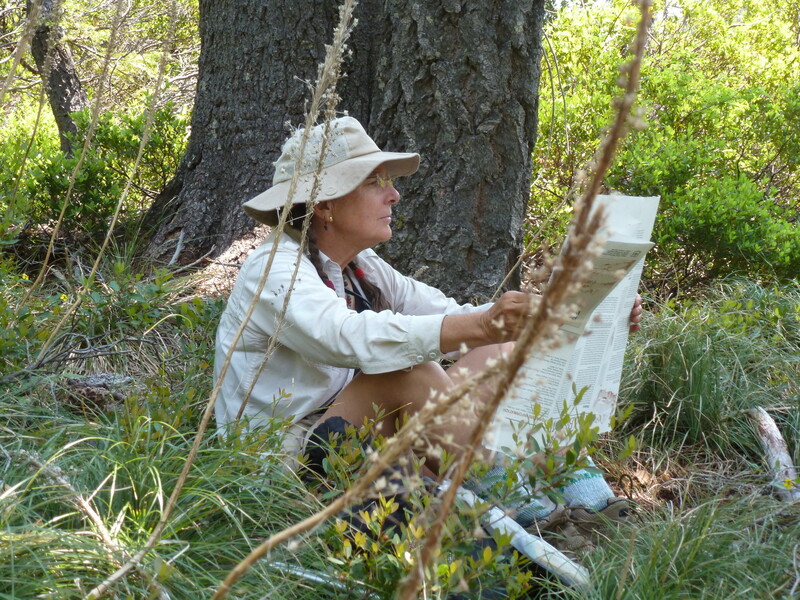 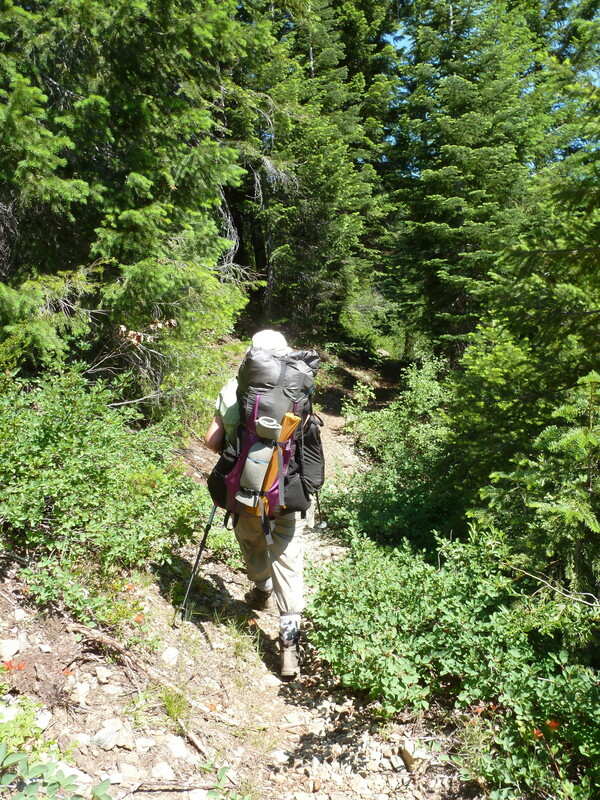 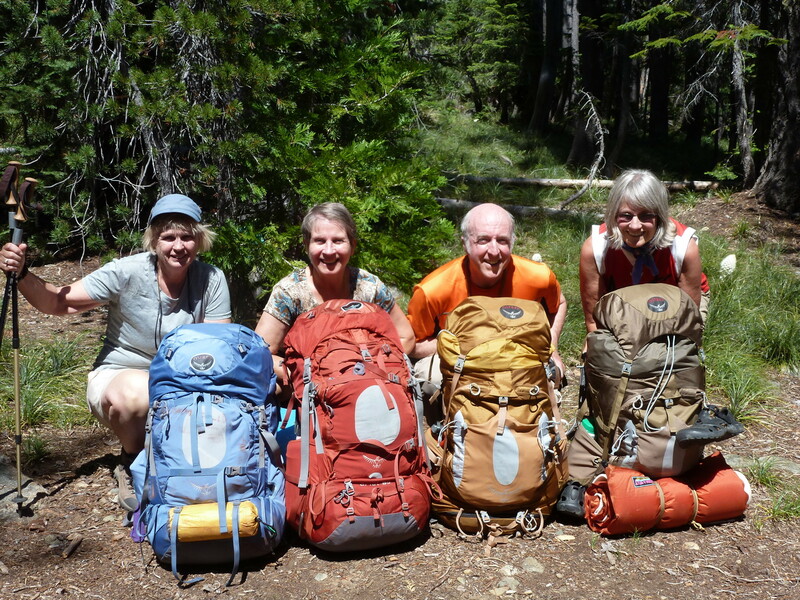 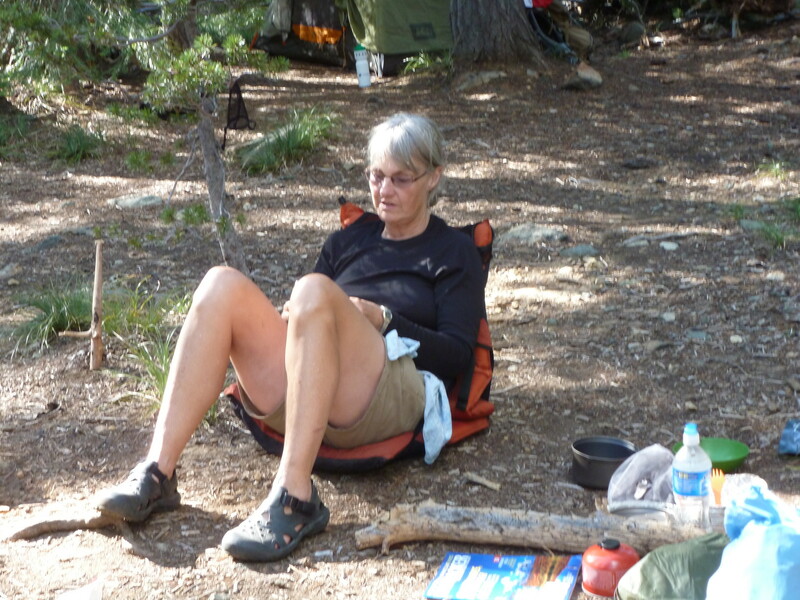 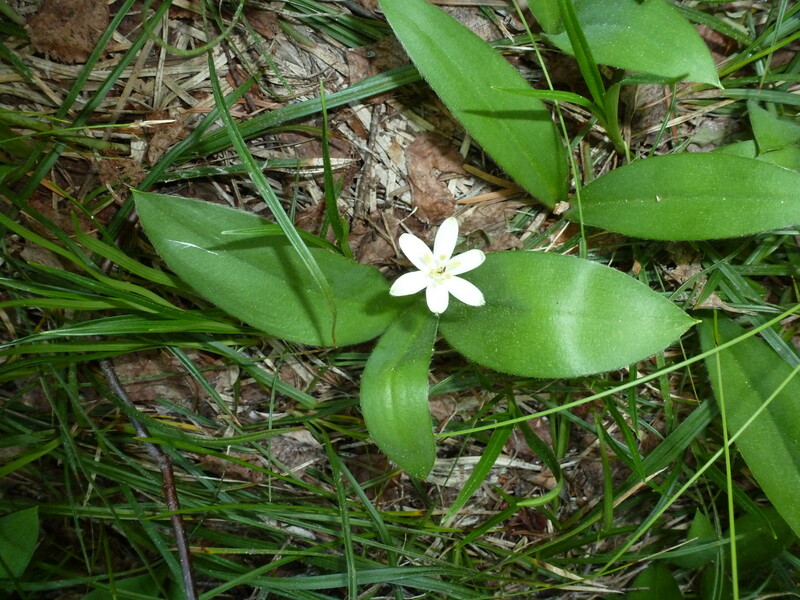 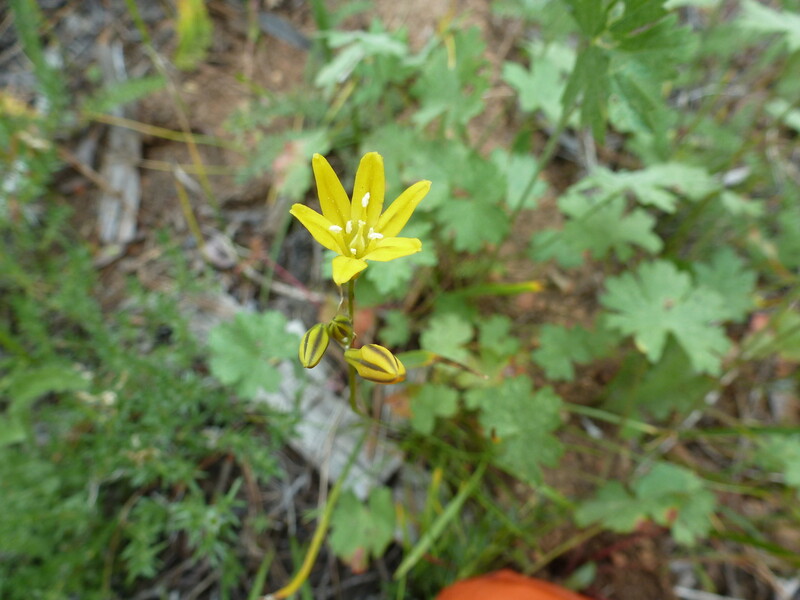 Backpackers on this trip: Gail P., Denise F., Linden C., Mary K., Maria G., Steve W.
This trip was originally scheduled as a thru hike from Cook&Green TH, PCT to Kangaroo Springs, Boundary Trail to Lonesome Lake or Cedar Basin, then to Azalea Lake, ending at Fir Glade TH. 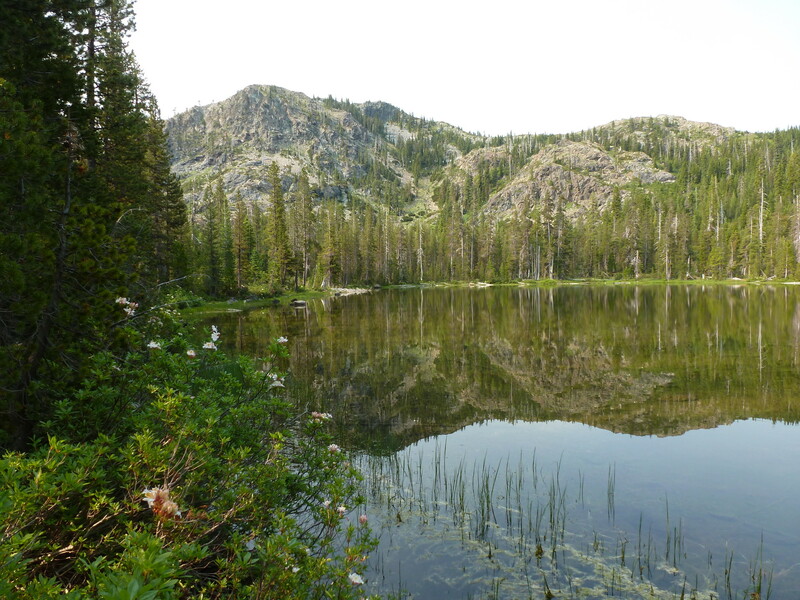 However, given the group size and the logistics of arranging a car shuttle or key exchange, we decided to go from Fir Glade TH to Azalea Lake and back out, with possible day trips to Lonesome Lake and/or Butte Fork. 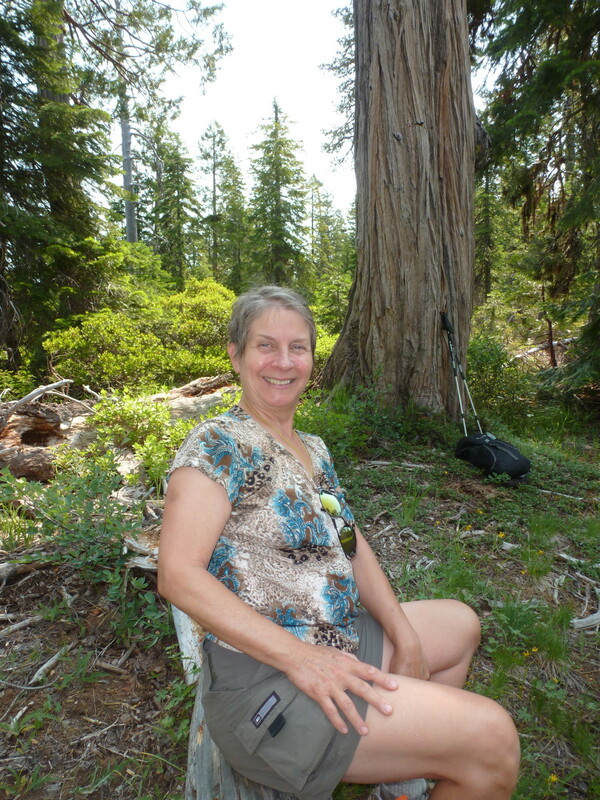 Thanks to our trip leader Gail for researching all of these alternatives. 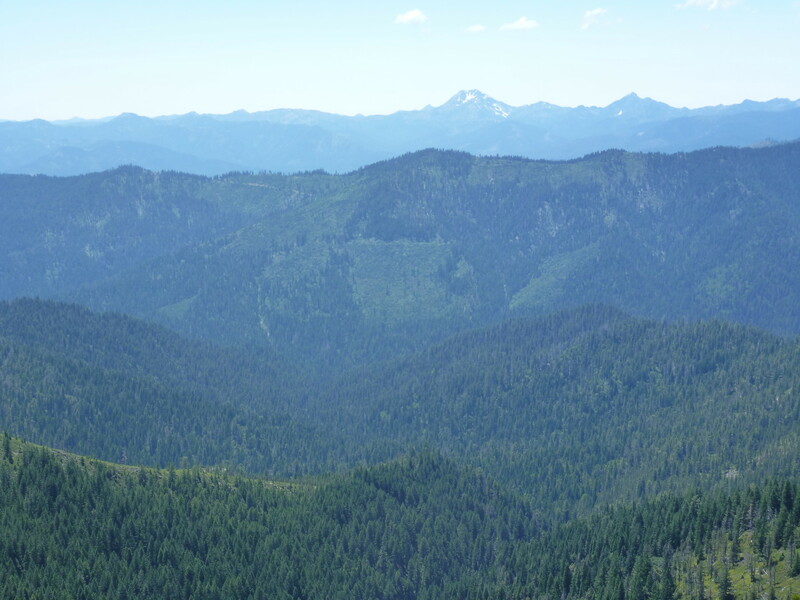 Day 1: Cars from Grants Pass and Ashland rendezvoused at the Applegate Store, then caravaned along mostly gravel and mostly poorly-marked roads for another 1-1/2 hours. 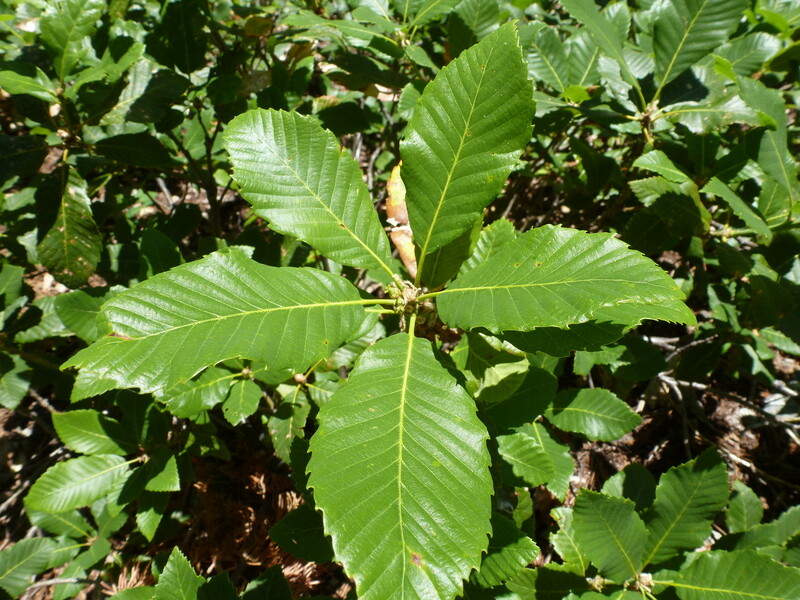 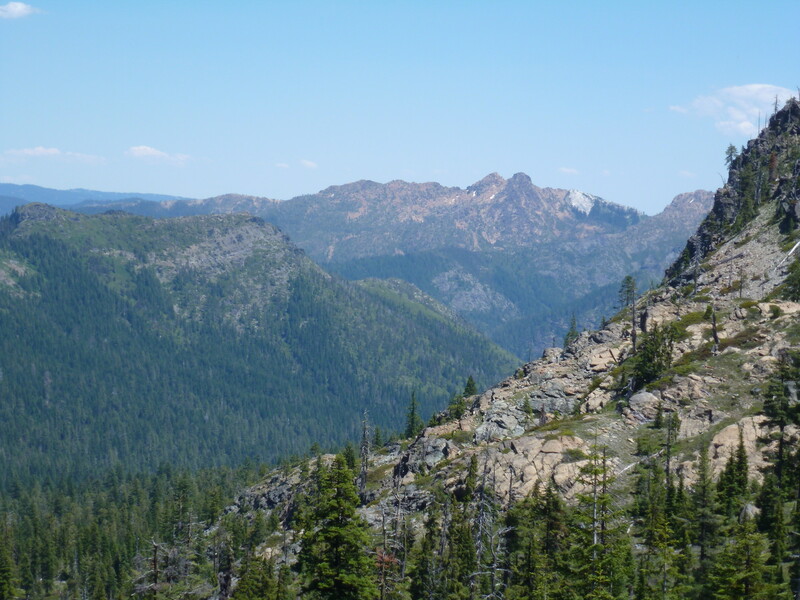 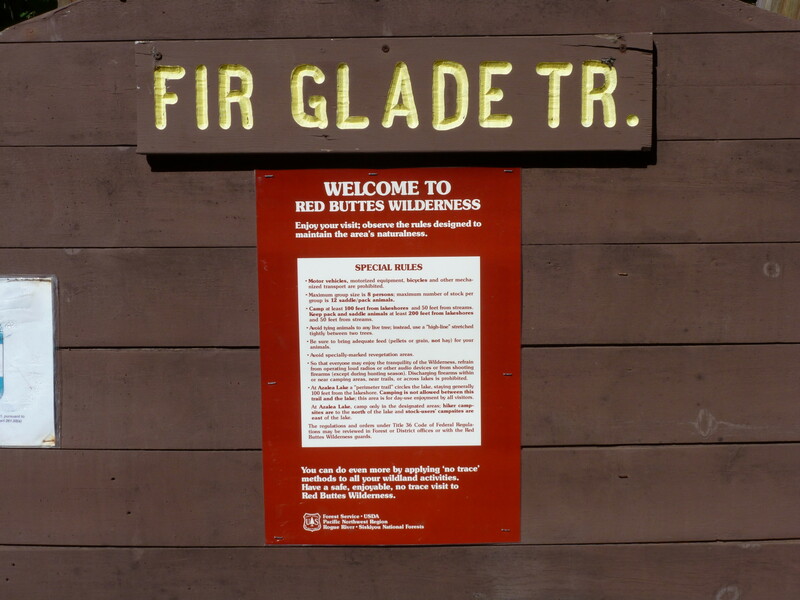 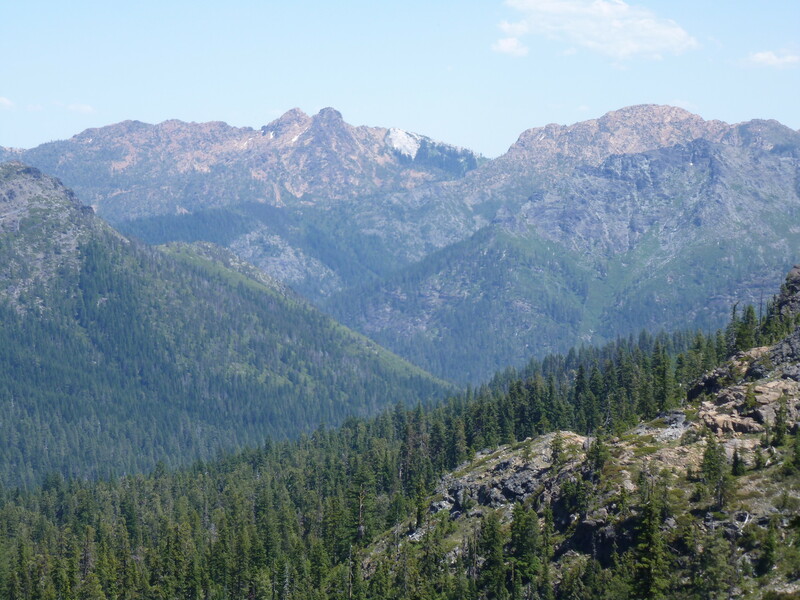 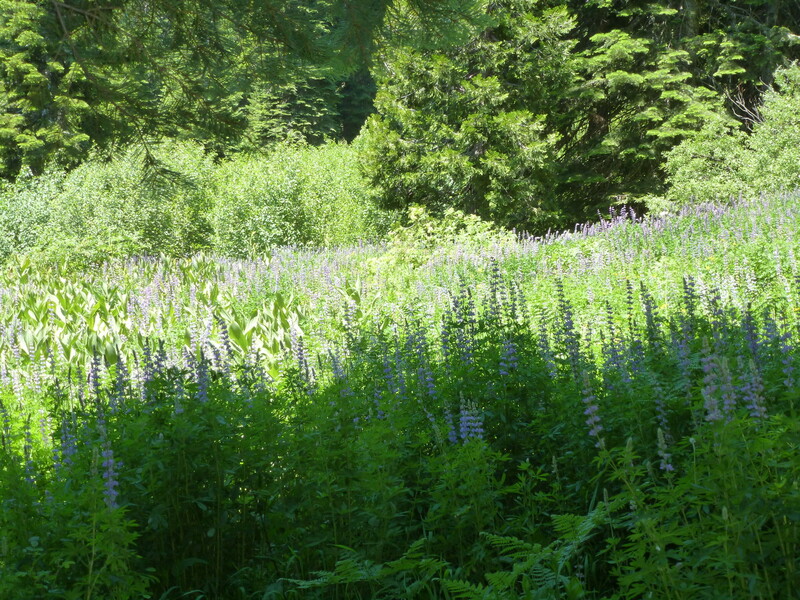 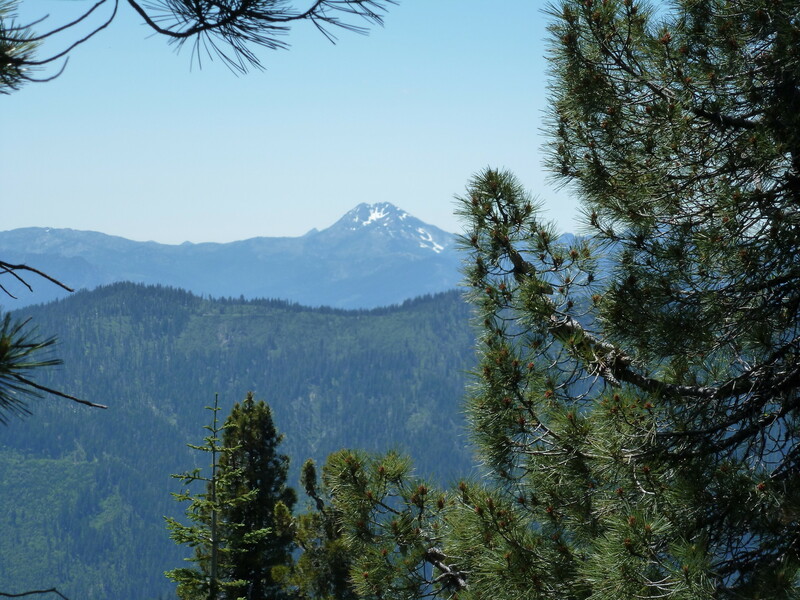 From the Fir Glade TH, we soon hiked across the border from OR into CA — with no agricultural inspection station in sight! 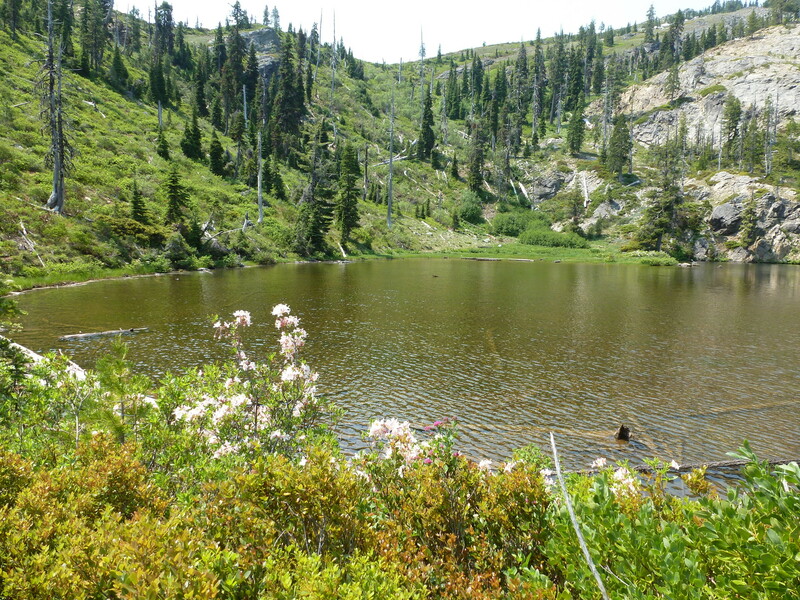 We carried water since after ~2 miles and several tiny creeks, Azalea Lake (~6.5 mi.) 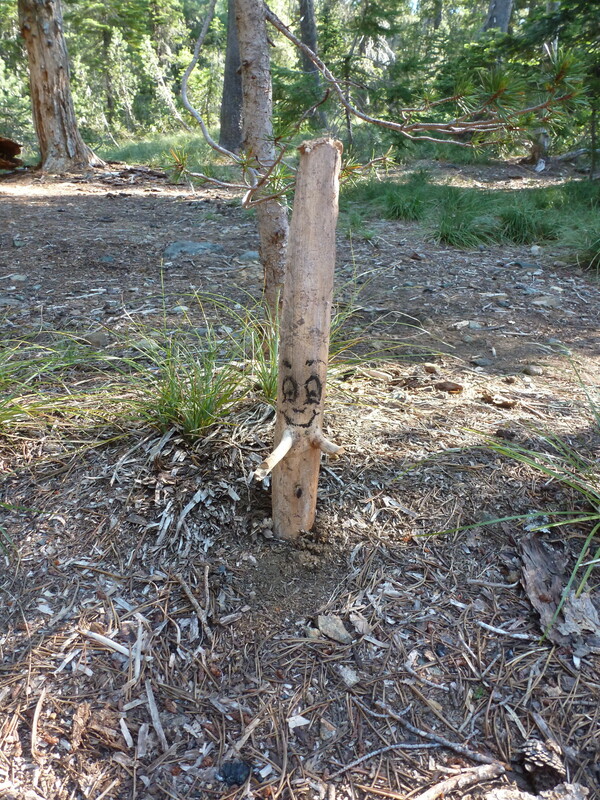 would be our next source. 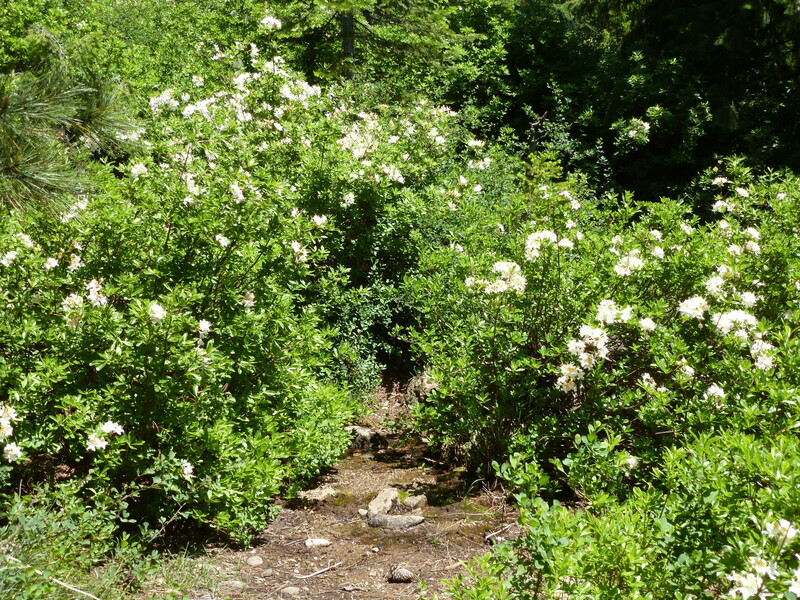 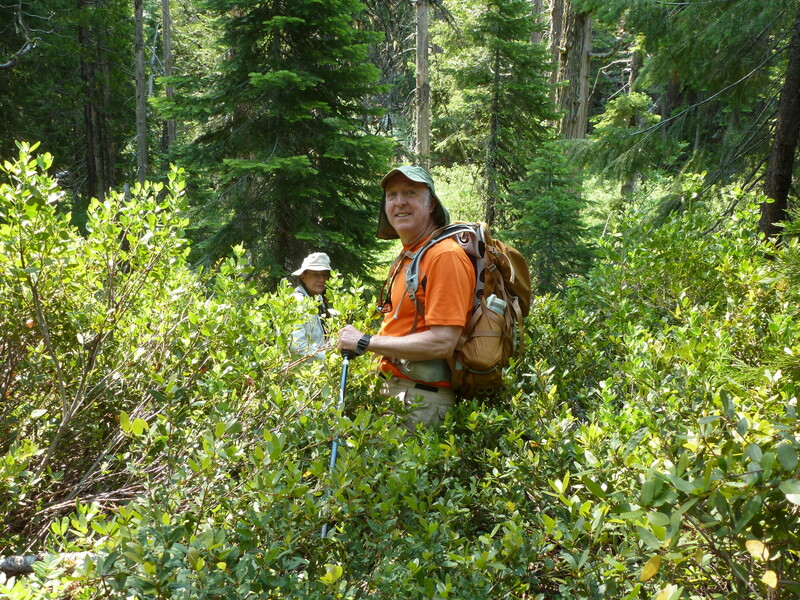 We waded through shrubs for ~1-2 mi., some in shorts due to the heat. 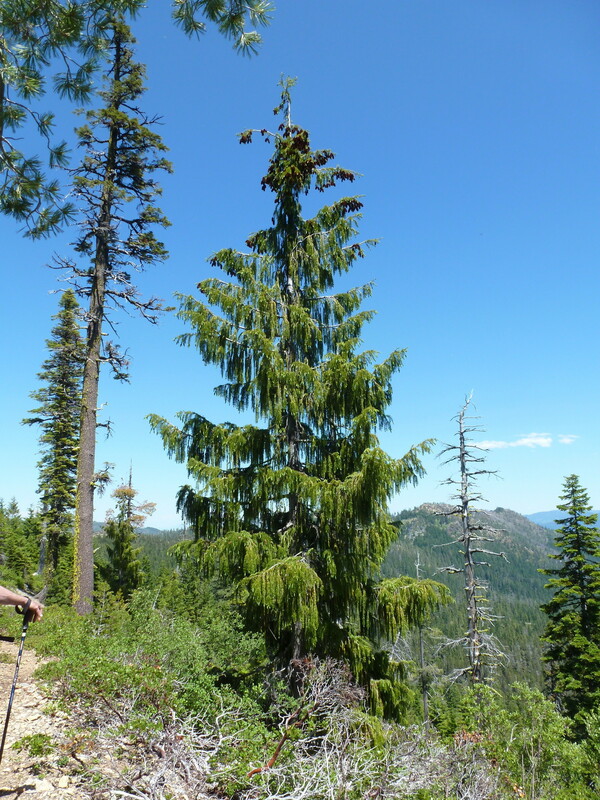 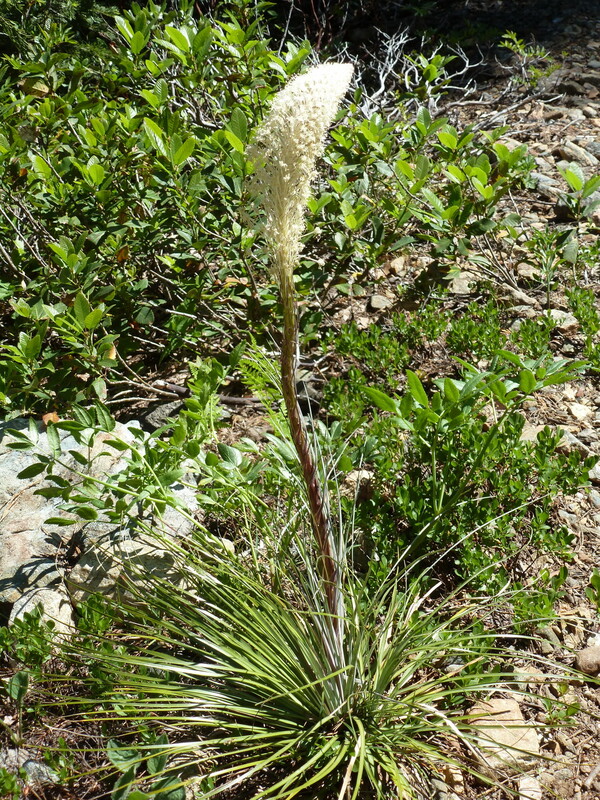 Near Thompson Creek Pass, we sighted our first Knobcone Pines and Weeping Spruces. 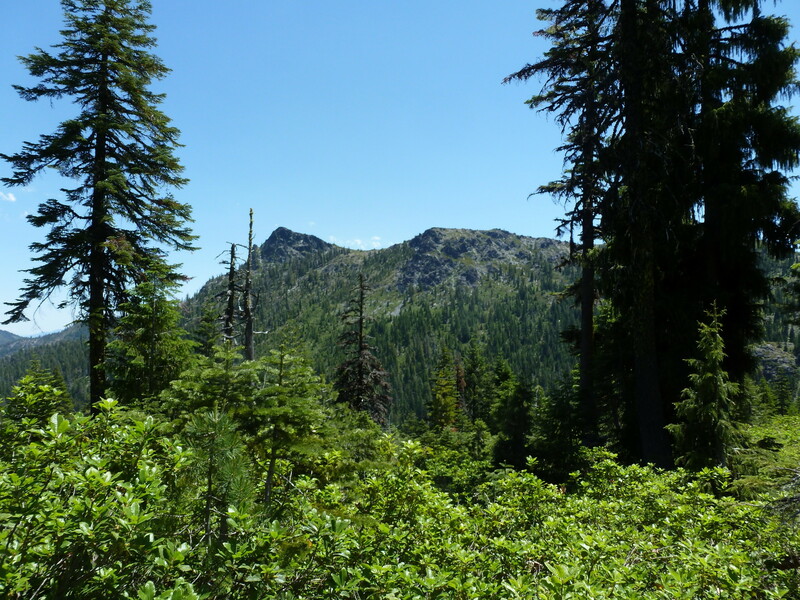 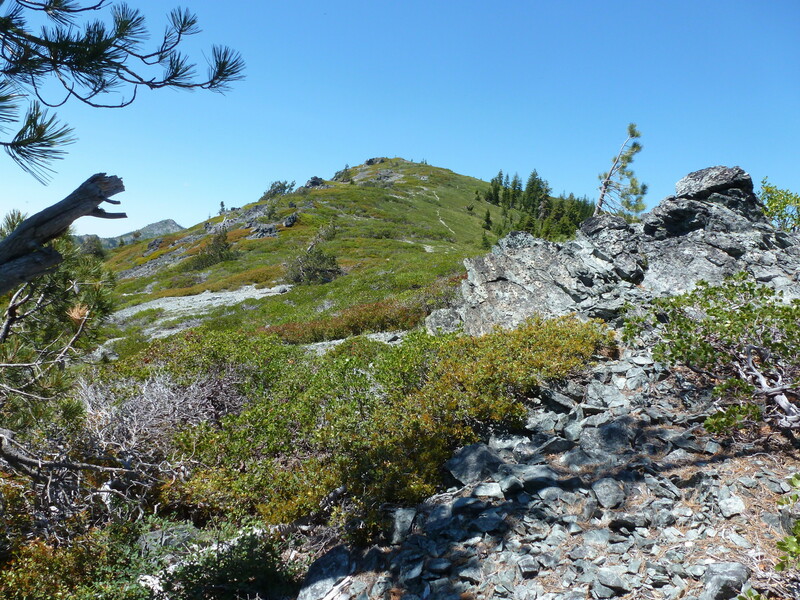 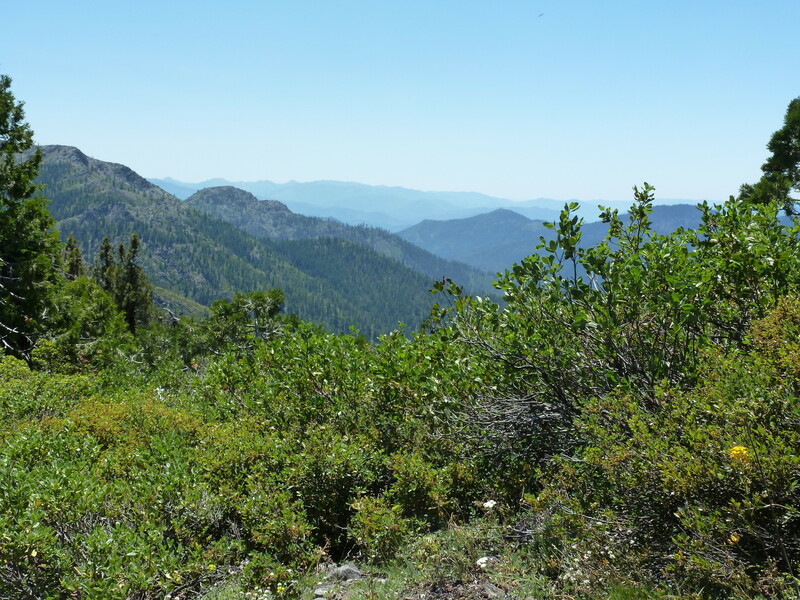 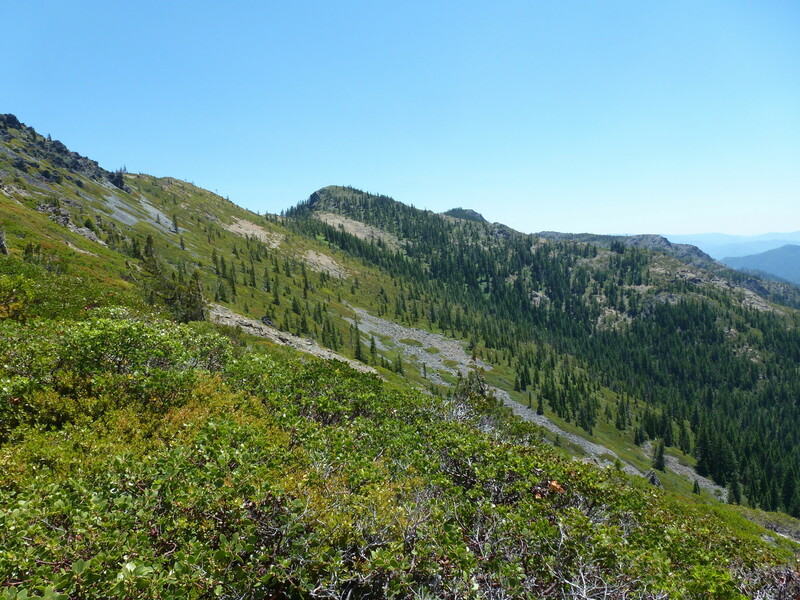 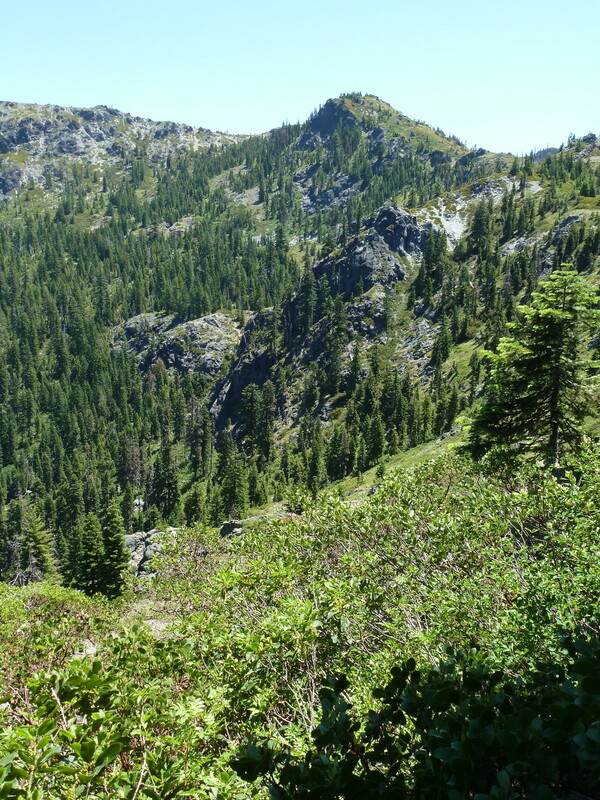 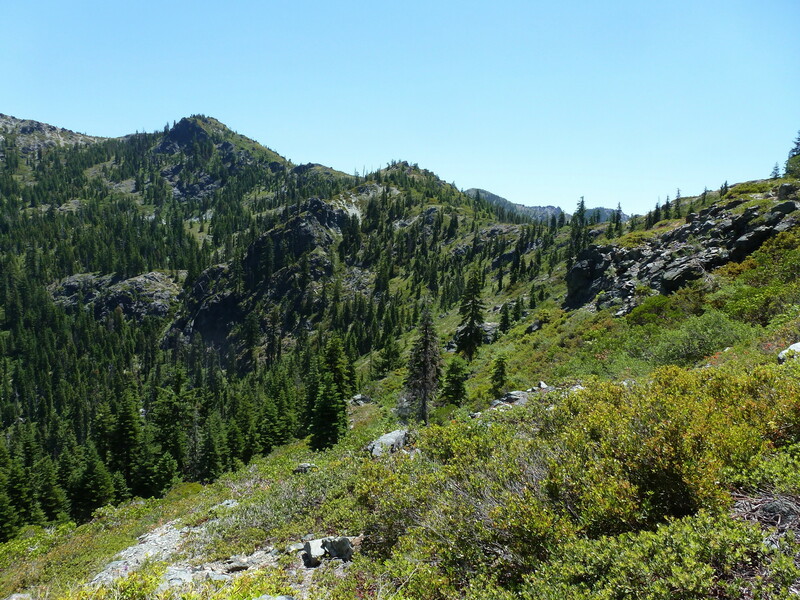 We navigated more overgrown sections on the way to Azalea Lake Pass (6000′), where we found some remaining patches of snow, and a view of Preston Peak in the Siskiyou Wilderness to the west. 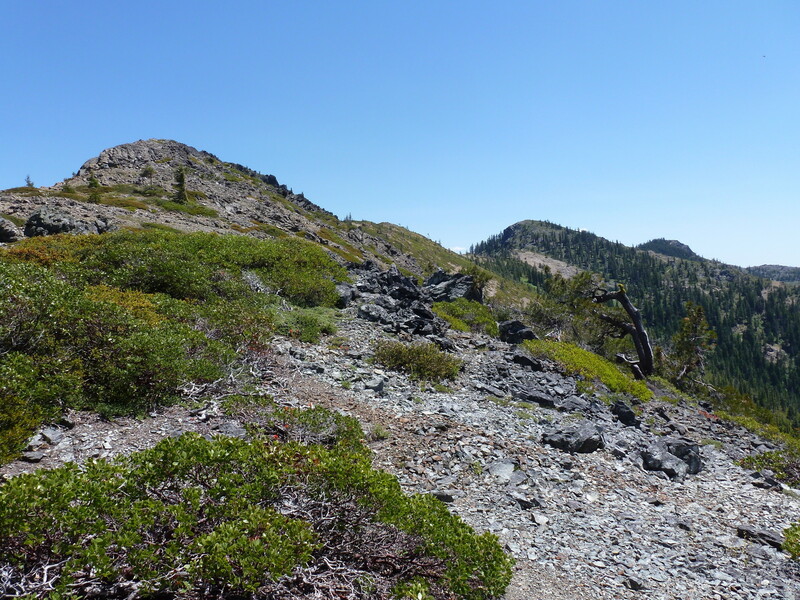 Then, it was all downhill (1.3 mi.) 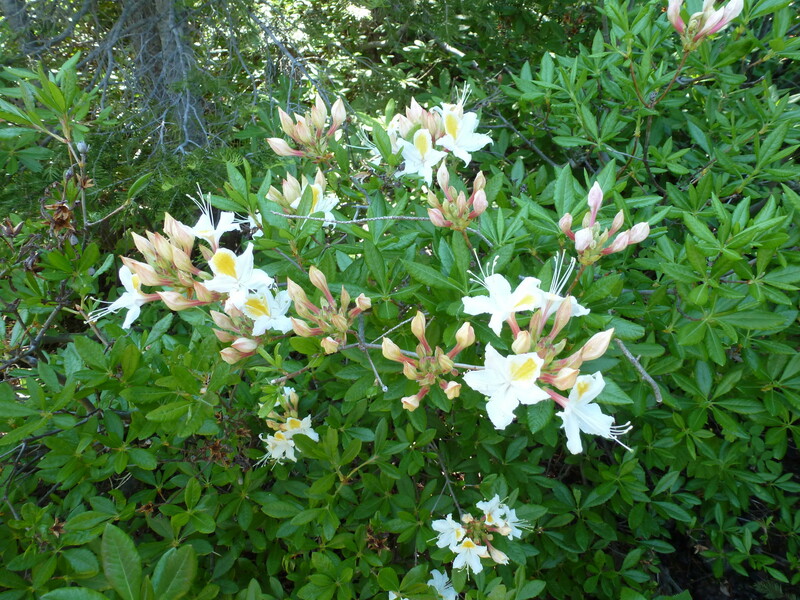 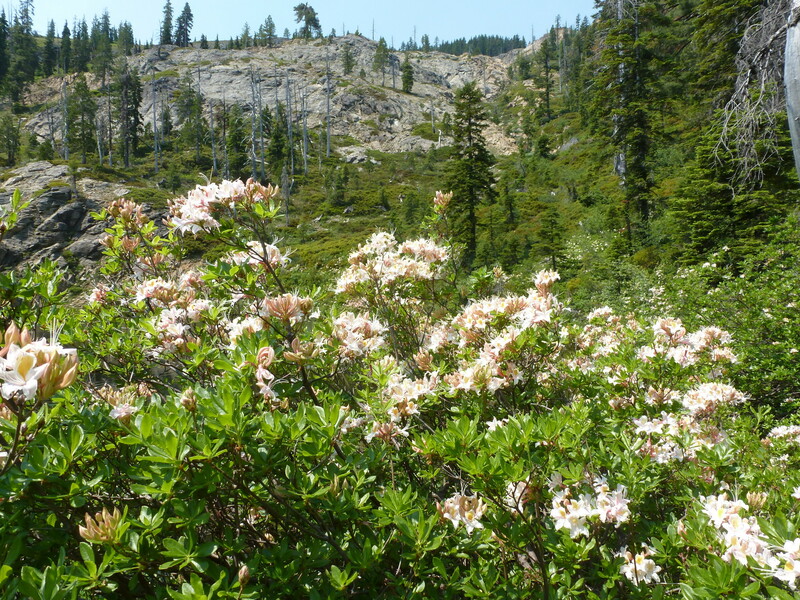 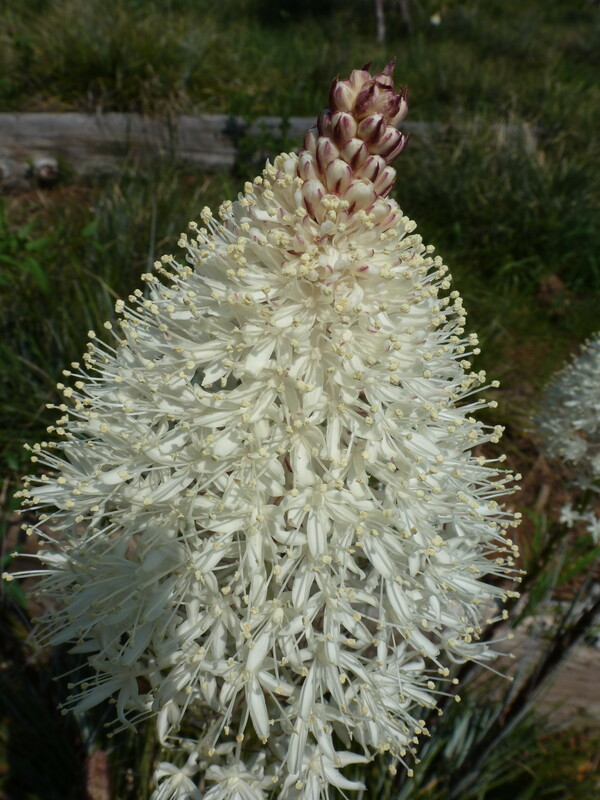 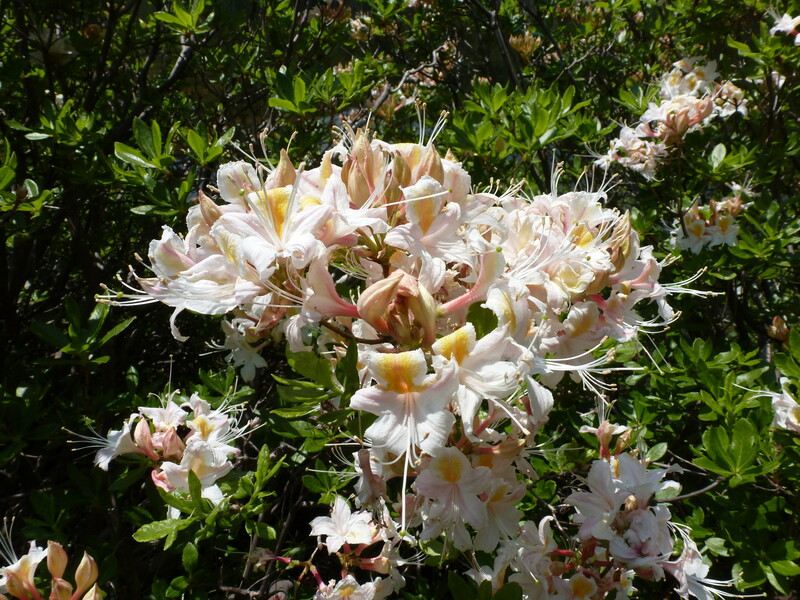 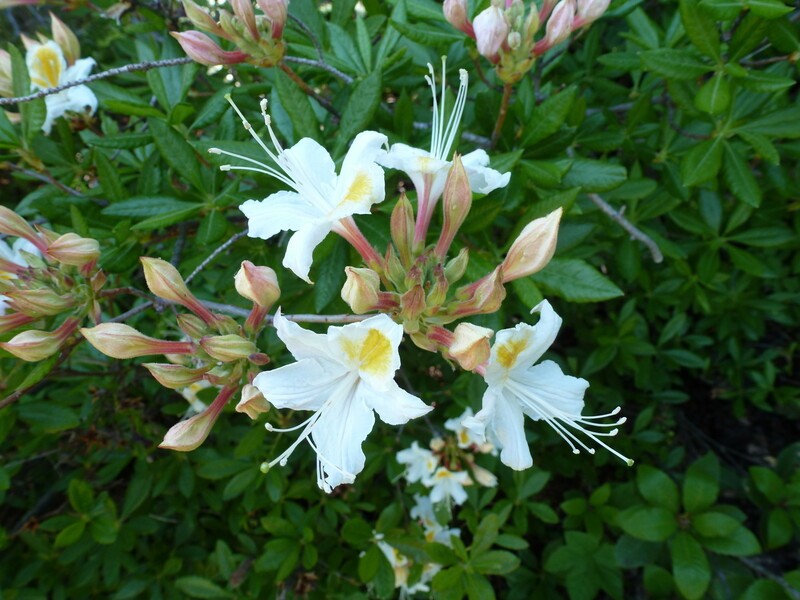 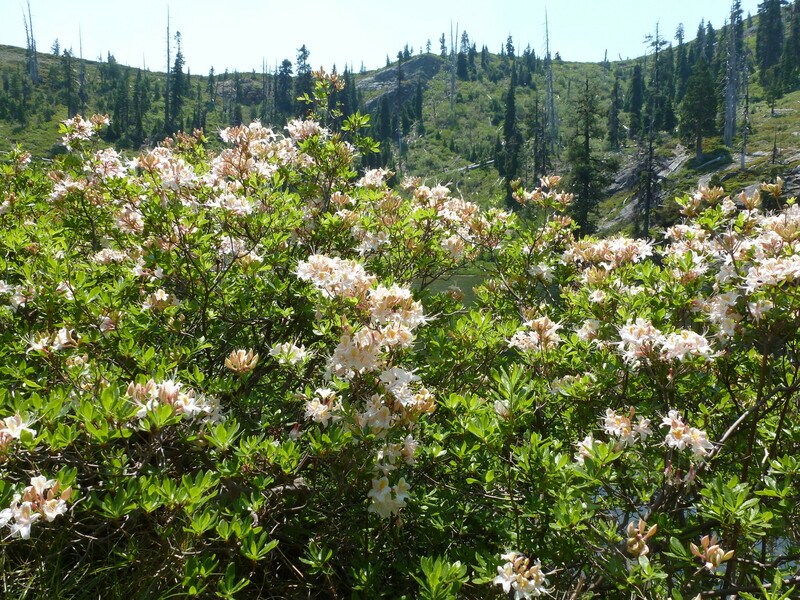 to Azalea Lake: azaleas in bloom, bear grass, views of the Red Buttes to the east, and bathing in the warm lake. 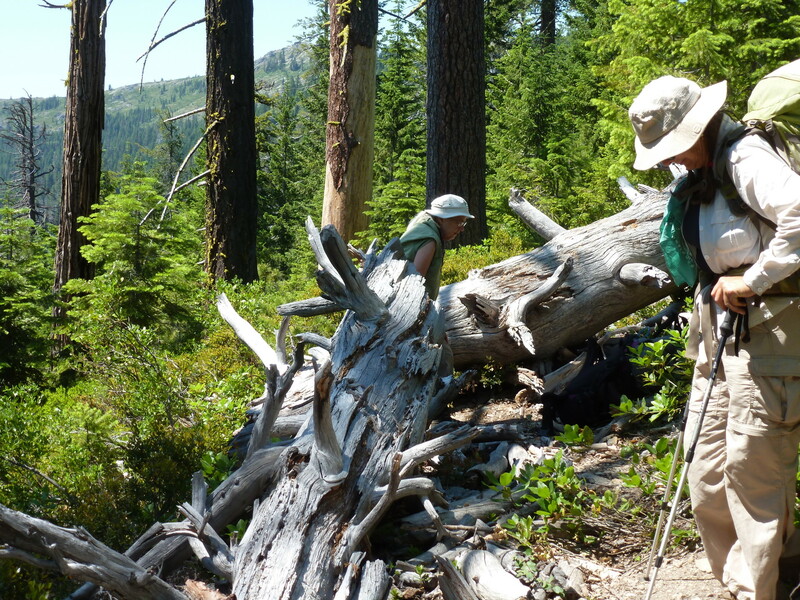 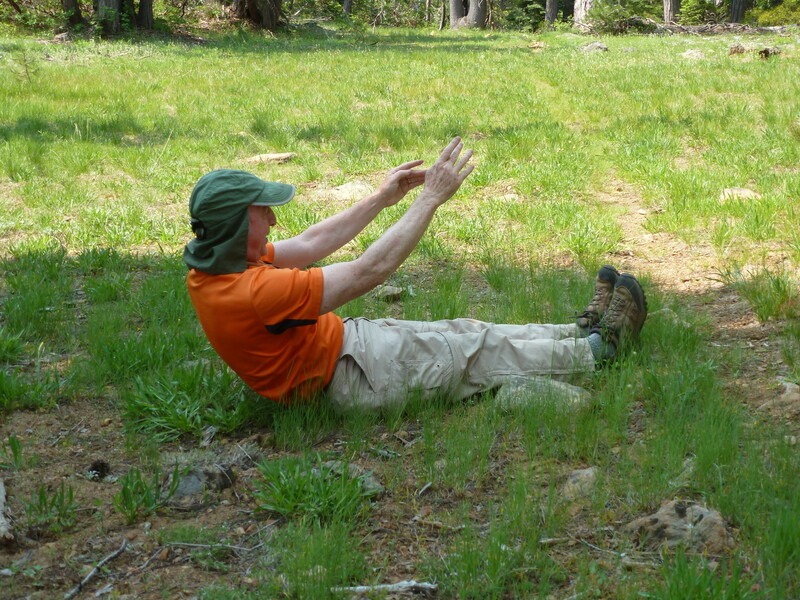 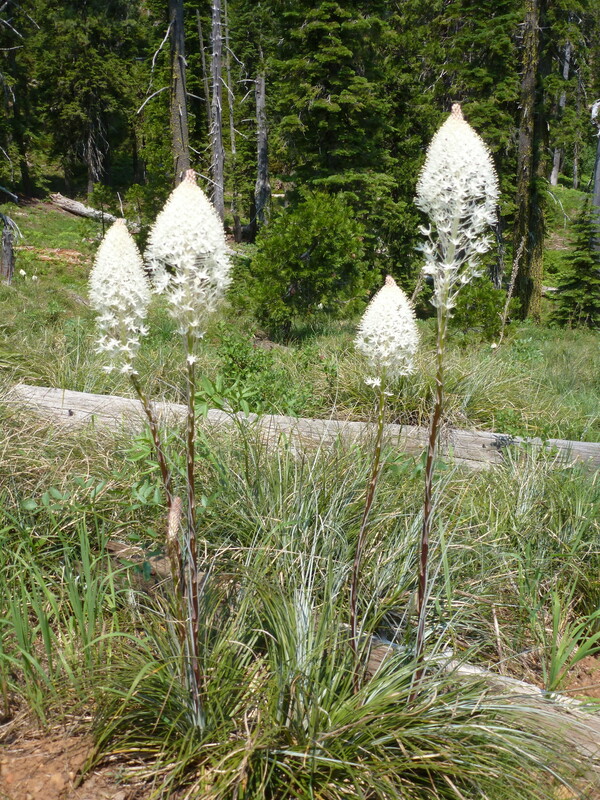 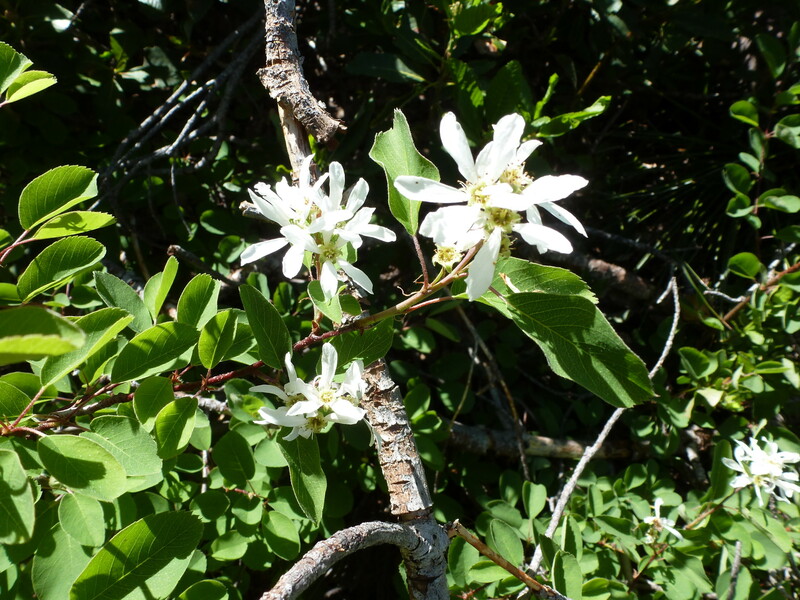 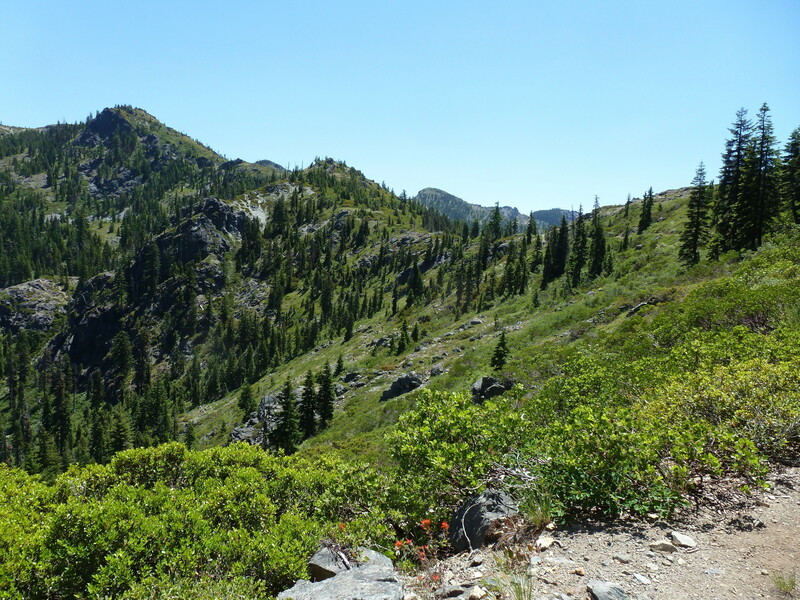 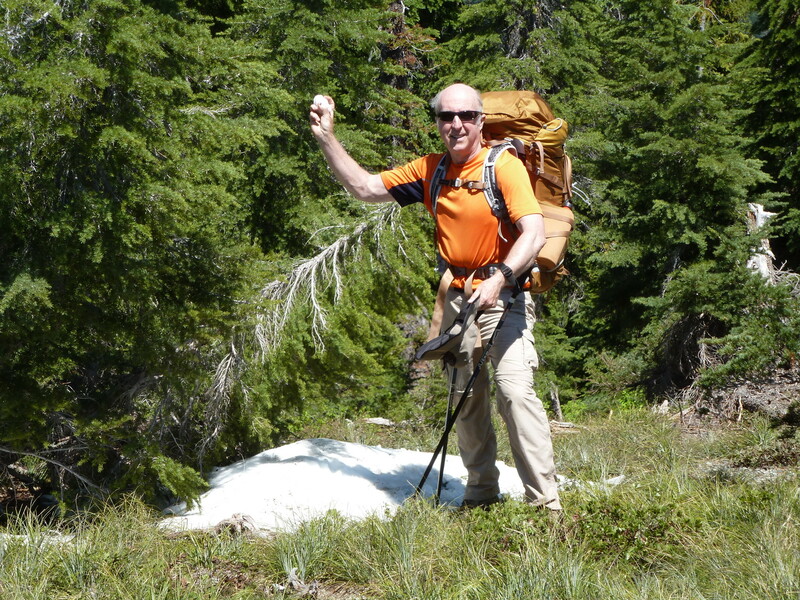 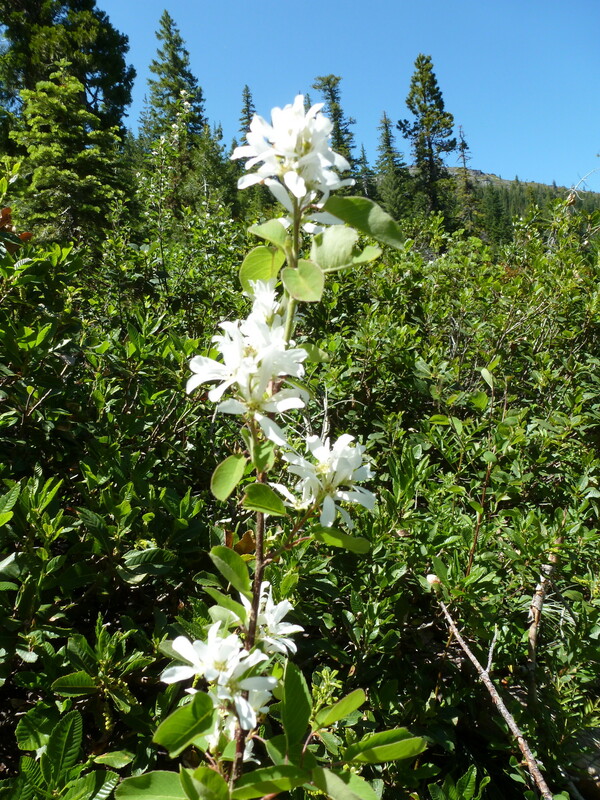 Day 2: For our day hike, we headed to Cedar Basin — and a trail fork. 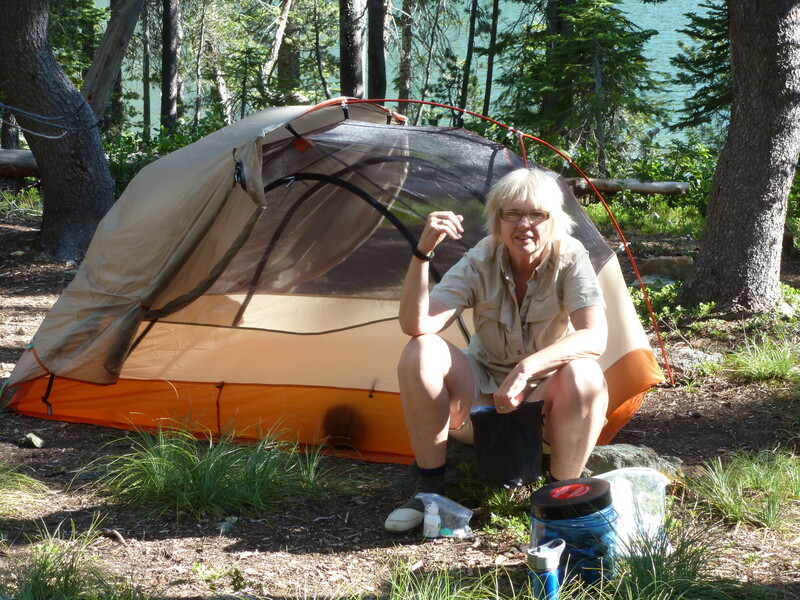 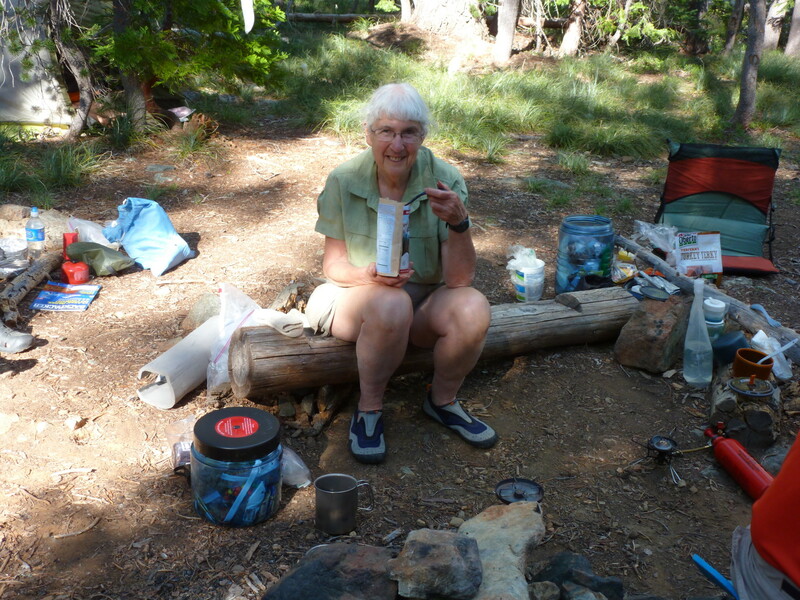 Gail opted to explore the Butte Fork trail; the rest of us were intrigued by Lonesome Lake — despite warnings from some hikers of even more bushwhacking (though they must’ve been off route, since we had little trouble routefinding, and waded thru fewer shrubs than the first day). 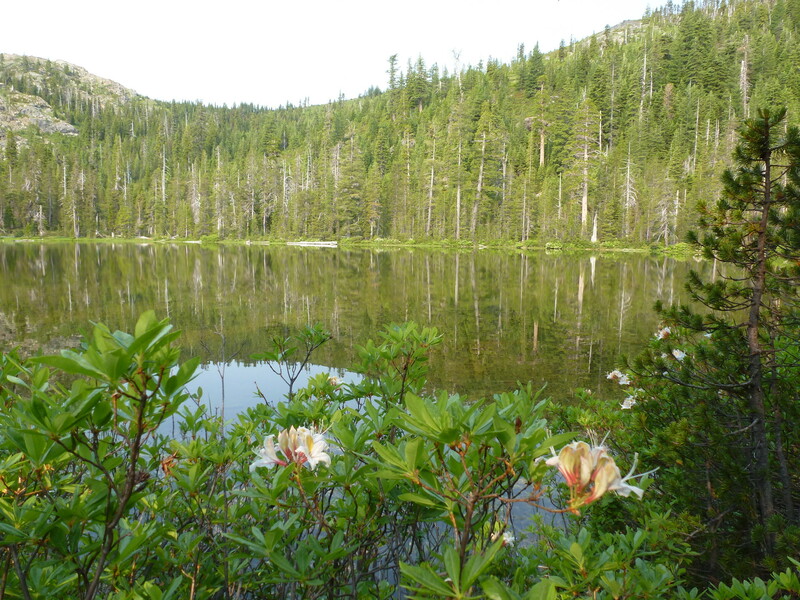 Lonesome Lake was a beautiful lunch stop: smaller than Azalea, with clearer water and even more azaleas. 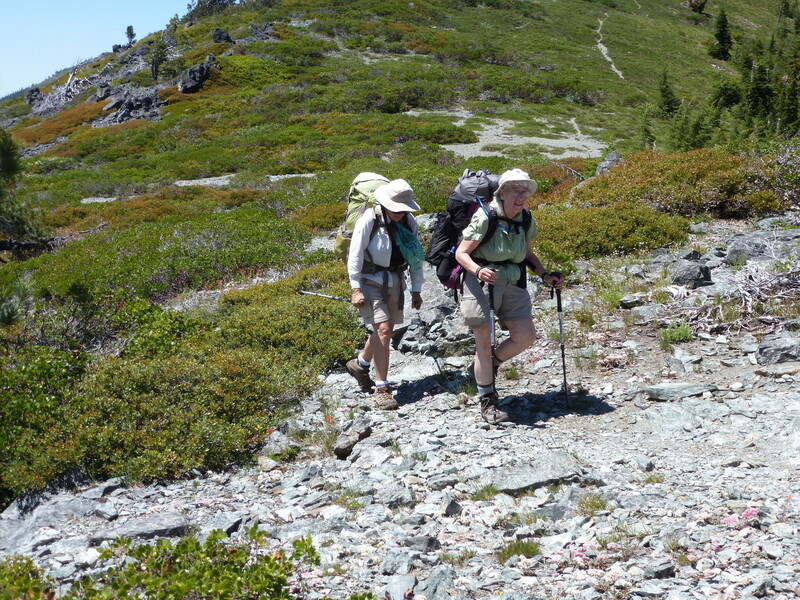 On the way back, Mary and Steve were unsuccessful in locating an old pack trail that would’ve allowed an ascent of Mt. 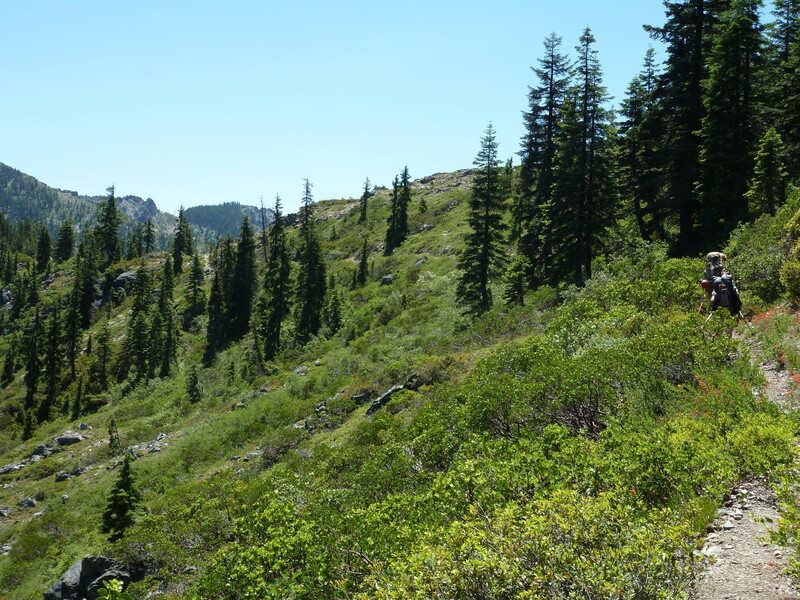 Emily (and presumably great views, if smoke hadn’t been increasing). 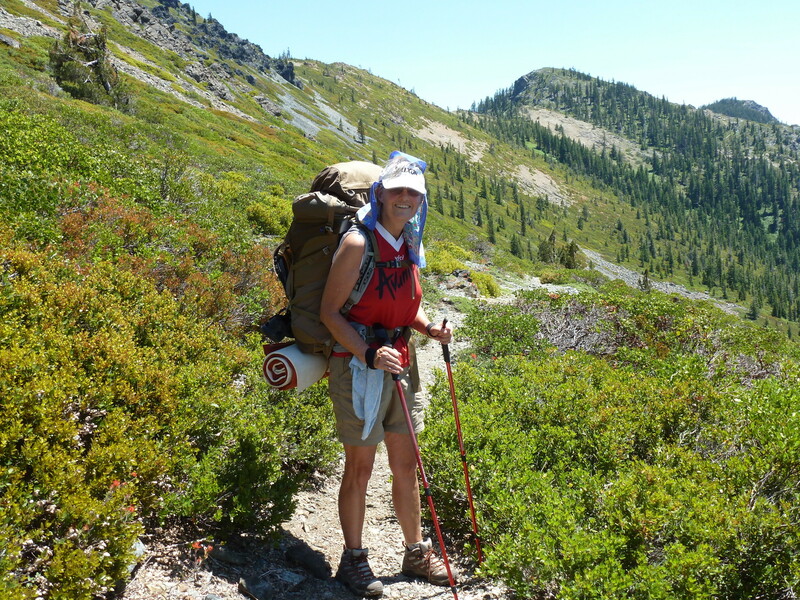 Day 3: The trip was originally planned for 4 days (3 nights); however, due to some equipment issues (i.e., sleeping pad punctures from the brush) and smoke from fires, we decided to camp just 2 nights at Azalea Lake before returning. 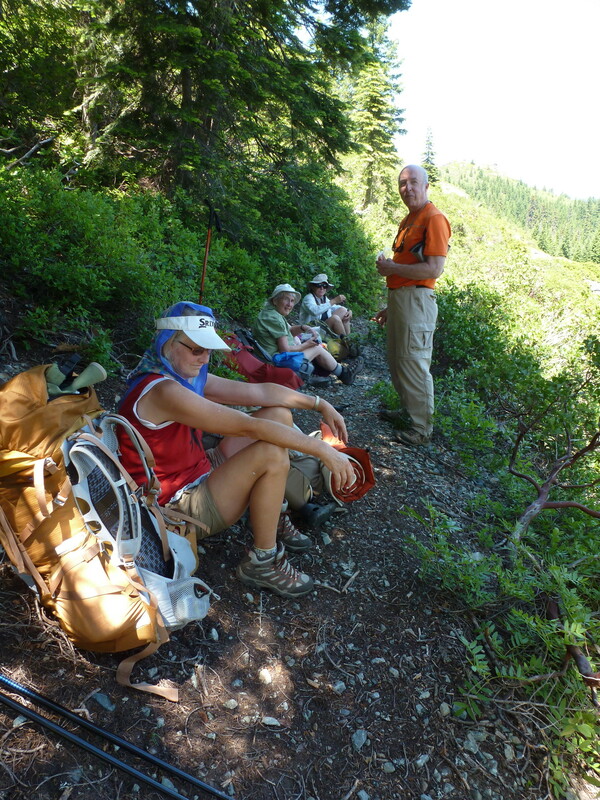 We were on the trail before 9am, back to cars by ~1:30, and stopped at the Applegate Store for cool refreshments. 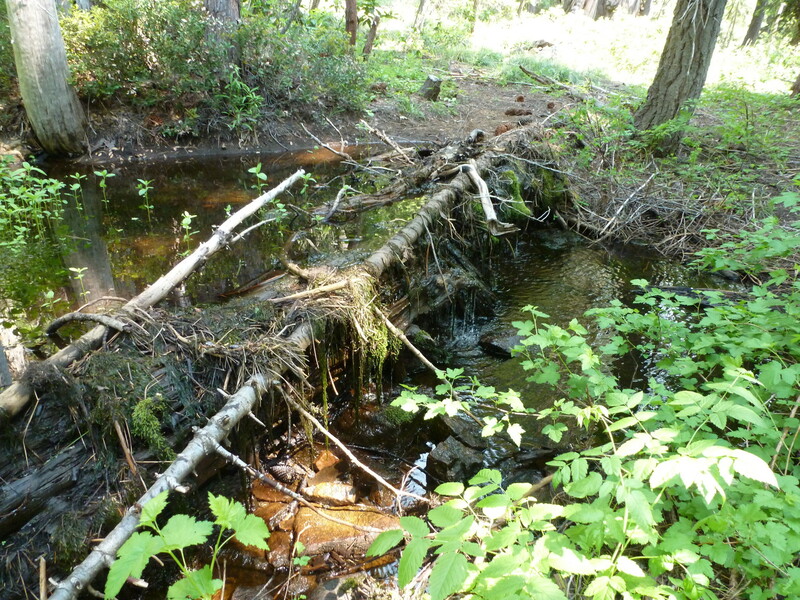 be sure to cross this creek, then turn right !